the pink is from charlotte russe, bought at the same time as the peachy orange color featured when i first blogged about nails. i was super disappointed in the formula, way chunkier and thick than the orange and it was hard to work with so it started drying way streaky. it ended up looking ok (on me, my sister's are worse haha) after three coats and a top coat (cuz these dry semi-matte weird) but idk if i'll use this polish again anytime soon. although i have gotten a lot of compliments, it maybe because this is a super noticeable bright color haha. 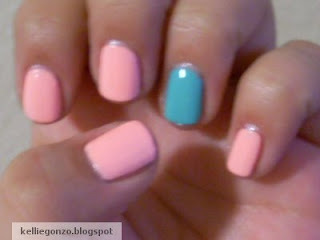 the blue/green color is the new cult favorite by china glaze called Dear Audrey, made for Audrey Hepburn. supposed to be an impression of Tiffany blue, w/o actually being Tiffany blue because it is copyrighted. i wore a shirt that matched the blue exactly today so it was pretty dope. i used two coats of the Dear Audrey. base coat was diamond shine by sally hansen and top coat was insta-dry by sally hansen.